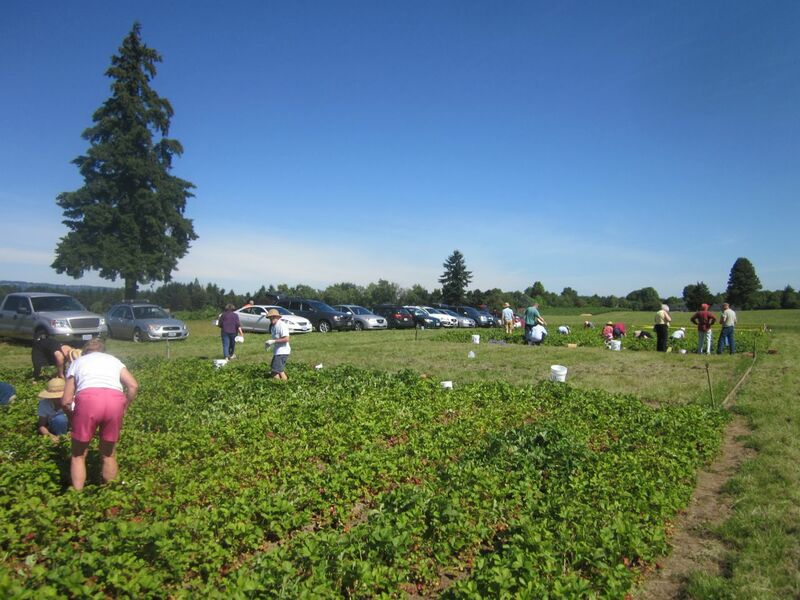 Strawberry season has finally arrived in Oregon. Jeff and I got to go pick berries at the North Willamette Research & Extension Service test garden because Jeff is a Master Gardener. It was a really good deal; just $3 a bucket. We picked 3 buckets-full (about 18 pounds worth). Perhaps we should have gotten more, but it was hot and we got pretty tired after more than an hour. It still took us several hours to "process" the fruit for the freezer today. It's well worth the effort to prepare the fruit for the freezer. Jeff first soaks the fruit in a solution of water and a small amount of vinegar. 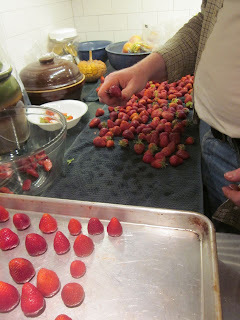 Then we remove the stems and place the individual berries on cookie sheets. We put the cookie sheets in the freezer for a few hours. Then, when the strawberries are partially frozen, we place them in freezer bags. Because of the extra effort, the strawberries don't freeze in one great big block and Jeff can pick out individual berries for use. Now we'll get to enjoy strawberry smoothies throughout the winter. Is that how you do that? That's awesome! I'm going to try that this summer! We're on the same page! I went picking Monday. I am freezing them with ice cube trays- one berry per pocket. Works great and requires very little space!